Of course I burst into happy tears. A few years earlier the publisher at New Hampshire Publishing Company had suggested Dan write this book, after Dan had written two novels and many short stories and articles during previous years. Now here it was, a guide to New Hampshire’s White Mountains and also to the history and flora and fauna of this place Dan had been exploring since boyhood. All of Dan’s decades of hiking experience and knowledge, his love of the land, his skills as a woodsman and a writer, went into this book. The book’s success made the publisher suggest a sequel. 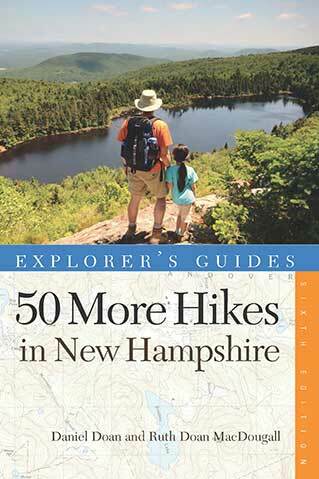 So Dan wrote 50 More Hikes in New Hampshire, and in subsequent editions the first book became titled 50 Hikes in the White Mountains. The publisher next suggested that he write a Vermont hiking guidebook. In his mild way, Dan replied, “It’s taken me fifty years to learn New Hampshire. I’ll stick to New Hampshire." Dan continued checking trails and updating the books until his health wasn’t up to it anymore. My sister and I then checked trails for him, and I joined my town’s hiking group to check more. After his death in 1993 I took over the updating of new editions, with family and friends continuing to help. And now the latest edition of 50 Hikes in the White Mountains has been published, the seventh edition. For the first time, the photographs are in color! Countryman Press decided that this book would be the perfect pioneer for this new format, having been the book that started the series. As I worked on the new edition, choosing the photographs that outdoor photographer Robert J. Kozlow sent me, and later as I saw the photos in the proofs, I knew that the book would be beautiful, but nonetheless when my advance copy arrived it took my breath away—and I remembered the arrival of that first copy forty years ago. As Dan used to sign his books: Happy Hiking!